We’ve made Thai Rice Soup a couple of times now. It’s a good soup that doesn’t take a super-long time. I’m not sure I’d recommend it for a weeknight, but maybe a weeknight if you have a little extra time. It’s spicy but not too much so. Mix pork, 1T fish sauce, 1T chili-garlic sauce, 0.75t pepper. Mix and form into 20 meatballs (approx 2t each). Place on a large plate and refrigerate. Heat dutch oven over medium-high heat with lard until shimmering. Add shallots and 0.5t of salt, stirring until browned, about 5 minutes. Stir in garlic until fragrant, about 30 seconds. Stir in ginger and lemon grass and cook until fragrant, about 30 seconds. Add broth, bring to a boil. Reduce heat to simmer for 15 minutes. Remove and discard lemon grass. Add meatballs, stir gently until cooked, about 5 minutes. Stir in the rice. Remove from heat and add 2T fish sauce, 1T chili-garlic sauce, 1t pepper, cilantro, and lime juice. Ladle into bowls and serve with lime wedges. Once again, this is from Milk Street’s Tuesday Nights cookbook. It’s still a recommended purchase. This is a terrible photo. Whilst cleaning out the freezer (still nesting, y’all – not pregnant. Really, really not pregnant. *shudders*), I found a number of stashed leftover chicken backs and wings and necks. I must have saved them to make stock and then forgotten about them. 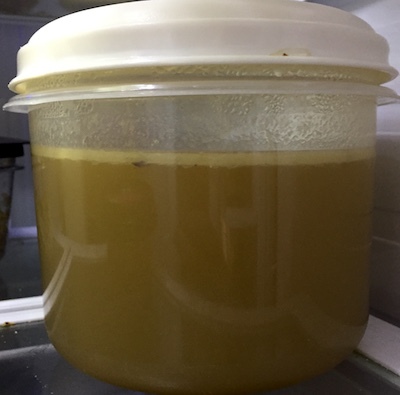 My go-to chicken stock recipe is easy enough that if I’d remembered they were there, I’d totally have used them. It takes roughly an hour and minimal ingredients for some pretty good broth. Heat some oil (1T-ish) in a stock pot on medium heat. Sauté the onion pieces. Once done, move them to a separate bowl. Add a little more oil. Place about half the chicken pieces in the bottom of the pan. Sauté until they’re no longer pink, about 5 minutes. Move to the bowl with the onions. Add a little more oil and repeat with the second batch of chicken pieces. Return the contents of the bowl to the stockpot, cover, and lower heat to low or medium low. Let cook for 20 minutes, until the juices have come out. Add 8c of boiling water to the pan along with 0.5t of salt. You can add a bay leaf at this point if you want. Bring to a boil, turn down heat and simmer for 20 minutes. Voila! 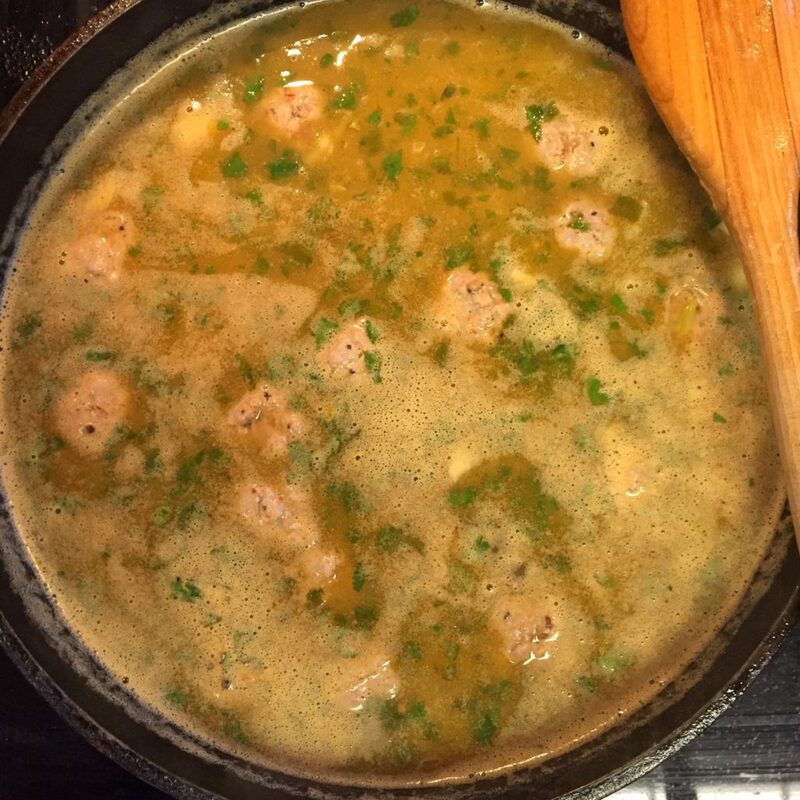 Use a strainer to drain the stock into a bowl, separating out the chicken and onion pieces. Let cool, remove fat that accumulates at the top of the bowl. Store until you’re ready to use it. This is one of the first things I learned how to cook as a post-college adult. It’s pretty easy, and homemade stock tastes SO MUCH BETTER that the store-bought stuff.